England Saxons scrum-half Ben Spencer reflected on a "dream" debut after helping his side to a 23-17 victory over the Ireland Wolfhounds at Sandy Park in Exeter. Saracens scrum-half Spencer - at 19-years-old the youngest man in the team - darted over from close range after just 10 minutes to settle his early nerves and No.8 Thomas Waldrom retrieved Freddie Burns's deflected chip through the Wolfhounds' defence mid-way through the second half. Burns added two conversions and his three penalties pulled the Saxons clear. The Wolfhounds responded with scores from David Kearney and Tomas O'Leary. Simon Zebo then struck in the closing seconds. "It's been pretty much a dream," said Spencer. "I got the call on Monday, came in on Tuesday, didn't expect the call to start and then to score was an absolute dream. 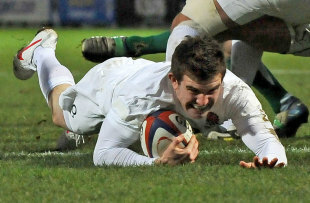 I was pretty nervous before the game, it took it out of my legs a bit, and to get a try early on just settled me down." The Saxons dominated at the set piece to help him ease his way into the game against senior Ireland internationals Isaac Boss and O'Leary. "It's always a pleasure to play behind a pack that's going forwards," he said. "Whenever they got a maul going we stopped that quickly, on our set piece we were clinical and the ball was on a plate for me so it was brilliant to be behind a pack that was so dominant." Waldrom was an injury replacement at the Rugby World Cup without getting on the field, and the Leicester Tigers forward made a big contribution even before his 53rd minute try. "It was good to get the first game under my belt," said Waldrom. "It was a big week leading up to it and it was good to get out and do my thing. You're put where you're put and you can only do your best from where you are. It's an important stepping stone and it was a big deal. "All 22 guys out there want to be pushing for the top team but you've got to perform, whether you're at the Tigers or here you've just to go out and enjoy it. That's what I did today." Saxons coach Jon Callard believes there is more to come from the side, too, as they add more precision to a big-hearted performance in front of the 8,000 Sandy Park crowd. "Technically you can go away and work on it but the thing you were going to get measured on today was heart and desire and hunge," said Callard. "We did that today and we were gritty and determined. "We weren't clinical and it wasn't flash but the boys dug in, especially the front five. They were exceptional in the work they produced and they did well to control that and give us some ball. It's easier to go forward when you're winning." The Saxons regroup next week before heading to Galashiels to face Scotland A on Friday, February 3.